The SITREX 420/11 windrowing machine, was built using the most up-to-date design techniques. From this comes a fast, efficient, strong and extremely versatile machine, which gives excellent results in regard to both quality and in working time. It is possible to set the height of the tines from the ground, level the machine horizontally according to the operating axis, and put the machine in the transport position, all without having to gel off the tractor. An 11 - arm reduction gearbox, completely encased, in oil bath, with specially designed cams, lifts the rake arms in a very smooth, uniform movement and thus the hay is stirred and released gently, avoiding the loss of foliage. Allows a wide range of possibilities in setting the working width, up to a maximum width of 13'9", which gives excellent results in terms of working time. The technical features of the machine make it possible to create well-structured windrows even on hilly ground or when turning the machine. The motion is transmitted to the machine with a constant-velocity universal joint, allowing the forming of a windrow of a uniform shape and size, even when making small maneuvers with the tractor. 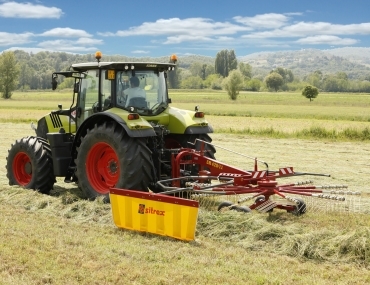 The particular action of the reduction gearbox makes it possible to harvest the greatest quantity of hay, because the tines attached to the rotating arms are in contact with the ground for a long. The machine is built with top quality steel and components, guaranteeing reliability and long life. An additional hydraulic system allows leveling of the machine according to the direction it is moving. This adjustment can also be done from the driver's seat. There is also a crank attached to the hydraulic cylinder for preadjustment or additional adjustment of the leveling system. The arms holding the tines have a special shape which prevents deformation and guarantees long life. Each arm holds four double tines made from high-quality steel, heat treated for great surface hardness and high impact resistance while working. The tines can be easily removed and replaced. The tandem design allows for a uniform path even on rough terrain.